483 out 653 Translations have been changed. Jayadvaita’s 1986 explanation of his changes to “Bhagavad-gita As It Is” published recently on VNN mentions many changes which seem to be justified. There are some typographical errors in the original 1972 edition of Srila Prabhupada’s “Bhagavad-gita As It Is.” That is accepted by everyone, however Srila Prabhupada accepted the book, and read from it and gave classes from it himself almost daily and many devotees claim Srila Prabhupada’s personally accepting and using the book means he approved of it. However, on comparing Jayadvaita’s changes to the original book approved by Srila Prabhupada himself, some devotees claim Jayadvaita’s revisions to the book appear to have changed the meaning of the philosophy in a number of places. Until now Jayadvaita has not offered any explanation for these revisions other than the letter recently published by VNN. 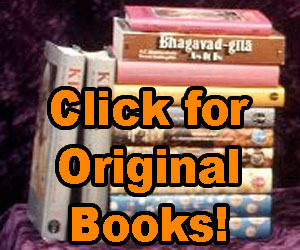 Srila Prabhupada authorized Jayadvaita Swami to edit his books, but some devotees have asked, “Where does Srila Prabhupada give Jayadvaita permission to ‘Revise and Enlarge’ his books as he has done for the Revised and Enlarged edition of Bhagavad-gita As It Is? Some also question if so many revisions will effect the potency of the book. However he has not provided any explanation at all for this change and after three weeks we simply get the same old 1986 letter from Jayadvaita which has been sent to the author at least five times already. This change is not mentioned in his letter. And some devotees claim there are dozens of very significant changes of this nature in the “Revised and Enlarged” Bhagavad-gita along with hundreds of others that subtly change the meaning of the text. These points are not cleared up in Jayadvaita’s letter. Hare Krsna. Since you’ve already decided what books you will accept as bona fide and what you will criticize as bogus, and since you are already sure enough of your convictions that you think it worthwhile to express them in a self-righteous and abusive manner, I have nothing to say to you except that I see no need for us to correspond further. Some devotees are not satisfied with such an explanation and feel it is their right to know why changes have been made to their spiritual master’s books which the editors are not prepared to justify or even discuss. Hare Krishna.You have shown that Bhagavad Gita,Chaitanya Charitamrita and Perfect questions and perfect answers are changed.Any other book has been changed as far as content is concerned? BBT change all the books each time they print them, that is Jayadviata’s philosophy for the BBT. Every printing should be a different book. The idea is to gradually change the books, because many do not like what Prabhupada taught. So BBT is slowly, slowly changing the philosophy in Prabhupada’s books by changing all the books a little bit every time they reprint them. So gradually the book BBT print will have no resemblance at all to the books that Srila Prabhupada wrote. This is precisely what happened to the Bible.